The MXS-chaining system allows efficient assembly of constructs that are optimized for synthetic biology applications in mammalian systems. The MXS-chaining kit includes chaining vectors with multiple cloning sites and standardized building blocks: 14 different fluorescent proteins, 10 mammalian promoters and enhancers, 3 polyA signals as well as selection cassettes and tools for inducible gene expression. This kit contains 55 plasmids and is shipped as bacterial glycerol stocks in a 96-well plate format. MXS-Chaining: A Highly Efficient Cloning Platform for Imaging and Flow Cytometry Approaches in Mammalian Systems. Sladitschek HL, Neveu PA. PLoS One. 2015 Apr 24;10(4):e0124958. doi: 10.1371/journal.pone.0124958. eCollection 2015. PubMed. 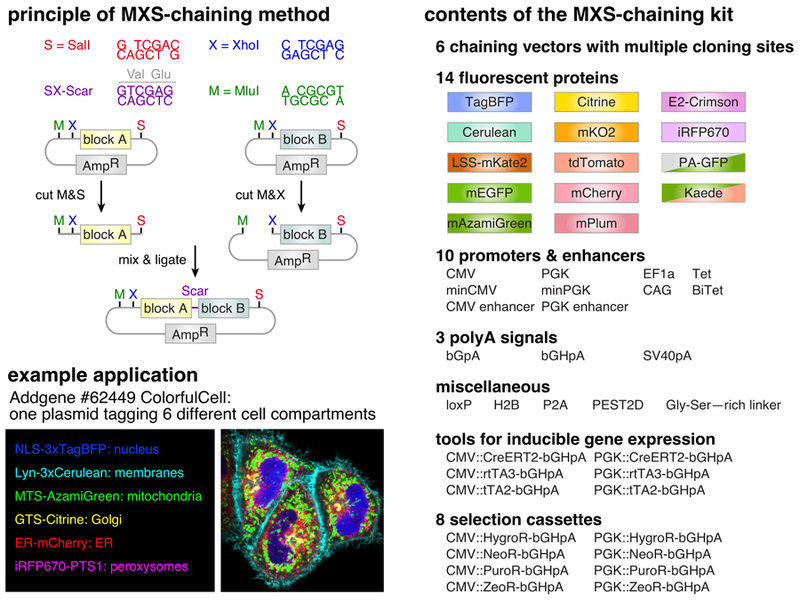 The MXS-Chaining Kit is a cloning platform that utilizes an iterative chaining process to combine individual building blocks, either preconstructed or custom-designed MXS plasmids, in a desired order to generate new plasmids optimized for fluorescence imaging or flow cytometry applications in mammalian cells. The MluI, XhoI and SalI (MXS) enzymes permit fusion of tags or fluorescent proteins to a coding sequence of interest, as the ligation scar is translated to valine-glutamic acid. Similar to other chaining based methods, the original pattern of restriction sites is regenerated after ligation of the two building blocks and the chaining direction is determined by the choice of enzymes used for the ligation. This cloning method has been used to modularly assemble highly similar sequences for various experimental procedures, including subcellular localization or visualization of processes in single, live cells. Figure 1. Schematic overview of the MXS-chaining method. Standardized building blocks can be chained directionally using the restriction enzymes MluI, XhoI and SalI. MXS-Chaining: A Highly Efficient Cloning Platform for Imaging and Flow Cytometry Approaches in Mammalian Systems. Sladitschek HL, Neveu PA. PLoS One. 2015 Apr 24;10(4):e0124958. doi: 10.1371/journal.pone.0124958. eCollection 2015. PubMed .